The Zinalrothorn (4,221 m) is a mountain in the Pennine Alps in Switzerland. 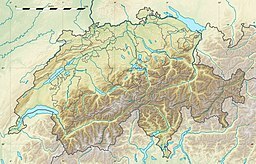 Its name comes from the village of Zinal lying on the north side and from the German word Rothorn which means Red Peak. When it was first climbed in 1864 the mountain was known locally as Moming. The Zinalrothorn is one of the high summits separating the Matter valley on the east and the Val d'Anniviers (or more precisely the Val de Zinal) on the west. The summit of the Weisshorn (4,505 m) is located 5 km to the north and the Dent Blanche 7 km to the west. At the western foot of the mountain lies the large Zinal Glacier and, on the northern side, the Moming Glacier. L'Epaule (the shoulder) is a minor summit lying at the base of the northern ridge. The villages of Täsch and Zermatt are the closest while Zinal on the north-west is located further (9 km). The first ascent was made on 22 August 1864 via the north ridge by Leslie Stephen and Florence Crauford Grove with guides Jakob Anderegg and Melchior Anderegg (AD). They left Zinal at 1 a.m. and ascended the Zinal Glacier. The reached the shoulder from the ridge connecting the Blanc de Moming at the base of the northern ridge at 9 a.m. The traverse of the ridge to the summit took them 2 hours, Stephen wrote later that it was 'the nastiest piece of climbing I have ever accomplished'. The slightly less difficult normal route, the south-east ridge, was first climbed by the combined parties of Clinton Thomas Dent with guide Alexander Burgener, and George Augustus Passingham, with guides Ferdinand Imseng and Franz Andermatten on 5 September 1872. The first winter and ski ascent was by Marcel Kurz and T. Theytaz on 7 February 1914. In the 1880s Mrs Aubrey Le Blond, the first president of the Ladies' Alpine Club, left her detachable skirt by mistake up the Zinalrothorn. To preserve her modesty, she made the decision to climb the mountain a second time to retrieve it rather than return to Zermatt in trousers. ^ Retrieved from the Swisstopo topographic maps. The key col is the Hohlichtpass (3,731 m). ^ Retrieved from Google Earth. The nearest point of higher elevation is southwest of the Weisshorn. ^ Goodwin, Stephen (31 January 1997). "Life lived on a higher level". The Independent. Retrieved 15 November 2014. This page was last edited on 9 April 2018, at 20:15 (UTC).